For a century rising sea levels were stable enough at around 1.8mm per year. 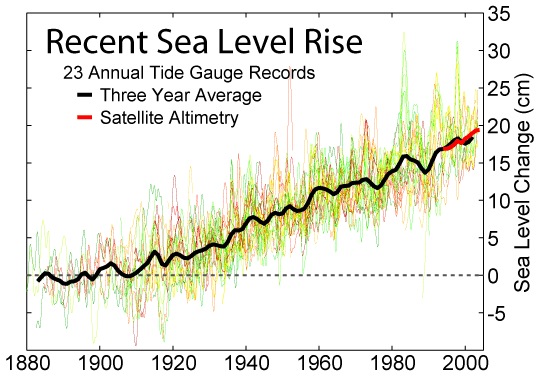 However, since 1993 sea levels have been rising at 3.1mm per year – a near doubling of the rate. And all due to global warming that not only results in melting glaciers and ice sheets but also increases the volume of the oceans because warmer water takes up more space. Sea levels will continue to rise at this accelerated rate for another century to reach between 190-580mm higher than today by 2100. …draw our eyes upwards as they follow their conditioned left to right path. Imagine going back 22,000 years, hard to do for us but a blink in geologic time. It is the height of the last major glaciation (remember that despite anthropogenic global warming we are presently in a warm period of earth’s history, an inter-glacial). At this time sea level was 120m lower than today. Now 120m is 120,000mm which means that the average rate of sea level rise needed to get to current level was 5.45mm per year – almost double again. 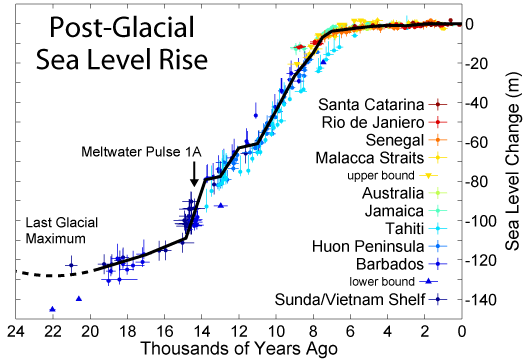 Go back to the height of the last inter-glacial 120,000 years ago and sea levels had risen 3m higher than they are today. The earth is actually a dynamic planet where these ups and downs in the oceans might be better called sea level fluctuations; for that is what they do given enough time. Try telling that little story to the close on 10% of the human population, a full 640 million people, who live within 30 feet (9,000mm) of sea level. The prospect of rising sea levels is real enough to them. Many of these direct effects have economic, cultural or flow on environmental impacts on coastal and island communities. Many of these people may be forced to move creating a category of climate refugee. Rising seas are real, just like climate change, and always have been. Current rates of sea level rise are not that spectacular in the scheme of climate variation but they are significant for one reason – people like to live by the sea.